A new month is here, already filled with plenty of inspiration! See the latest products from the world at large. Textiles made from charcoal, furniture that is interchangeable, decorative homes for plants that reduce air pollution, lighting made from factory remnants, and oodles of innovations from the hottest new talent reside in this issue. Design contests call for the latest entries and initiatives aim to develop and nurture the creative process. All of this and more – get inspired with the April edition! We attend over 100 design events a year on your behalf to bring you trend insights and design movements to help you maintain cutting-edge knowledge of the lifestyle and design markets. Currently we keep readers in 7,663 cities within 157 countries in the know! Are you reading Trendease.com? Bangkok — International inspirations help us add a little spring to our step this month. Read Jennifer’s tidbits on what is around the corner and on the horizon. Topics include playfulness and memories from childhood, materials and how they are utilized, and influential merchandising. Subscribers can also see the "Green Furniture Factory for Sustainable Environment" project presented in Bangkok. Worldwide — As space becomes more and more precious and we become more and more conscious of the environment, the urban garden grows in importance. At trade events, retailers, showrooms, and design studios across the globe plants are getting the design treatment. 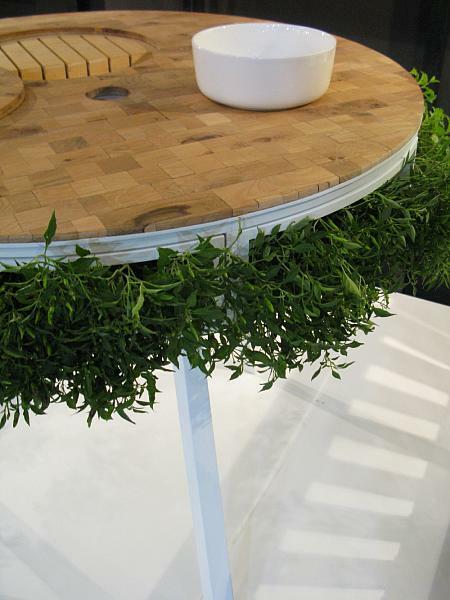 New furniture and accessories for our green friends are entering into the market for indoor and outdoor use. Stockholm — Scandinavia is known for its modern, bold, and bright designs. In 2010 the creativity coming from the Nordic region is truly inspirational. Contract and residential buyers have a vast range of products from which to choose. Ergonomics, green ideals, new talent, childlike forms, refreshing silhouettes, and innovative thought span across the region. And a fun spirit prevails. Worldwide — Big, block, bright are three words describing color in furniture and tabletop for the coming season. While pastels have been emerging onto the scene for textiles and decorative items, as witnessed in this gallery, the rainbow brights are still shining through the economic crisis and are as sweet as a hand full of Skittles. Worldwide — Oftentimes it is the little things that count. It is the case with many things, the light in the corner, the colorful flower petals sprinkled on your salad, someone holding the door open for you because your hands are full, a little kid smiling and waving at you as you pass by, or a complete stranger telling you that you have a fantastic smile. The same goes for merchandising. What is your cherry on top? Bangkok — As part of its effort to stimulate the development of Thai designers, the “Design Excellence Award” continued this year. DEmark gives recognition to outstanding product design. We particularly like the sculptural and contemporary forms of the winning pieces, as well as the clever use of materials: a handbag made from discarded coffee packaging, textiles derived from bananas and charcoal, as well as biodegradable packaging. Hong Kong — This woman is one hot ticket! She works in product development and high-end residential and commercial interior design around the world, mainly in Asia and the Middle East. She is also an art consultant. The lifestyle designer at CHi lifestyle design, and the director of design and marketing at House of the World, both part of the Kayel group of companies, she certainly has a number of projects under her belt and a myriad of travel stories to share. Singapore — During the International Furniture Fair in Singapore one could find design by new talent sprinkled throughout the show. The largest concentrations were found at Platform and the Furniture Design Award showcase. Both are part of the Singapore Furniture Industries Council initiative called Furniture Design DNA (Develop, Nurture, and Accelerate). Bangkok — The “Waste to Wealth” project recruits consultants to analyze issues and ways of using factory scraps to create value, while addressing the problem of Thailand’s growing waste challenge. Common scraps are wood cut-offs, plastic and resin remnants, fabric and leather pieces, as well as metal and alloy odds and ends; many of which end up in landfills. Did you know that in the Bangkok metropolitan area alone, 9,000 tons of solid waste is disposed of each day?!?! Multiple European Cities — This week’s trendy gallery is in tune with the weather, boasting a bright color that has been seen everywhere for the coming seasons. Whether it is standing alone, mixed with black and white, or within a pastel or rainbow-bright color story, this vibrant color is worth noting! Bedding, bath, upholstery, window treatments, wallcoverings, tabletop, lighting, just to name a few product categories, are dousing themselves with this hue. Milan — Bon giorno! Very warm greetings to you from the madness of Milan Design Week. Although it seems to be a bit on the quiet side this year, relatively speaking of course, there is still the gigantic fair at the Rho Fiera and approximately 500 external events; so we have our work cut out for us. In this week’s gallery subscribers will find some of our interesting discoveries in Milan, thus far. Multiple European Cities — In this week’s gallery find an abundance of ‘happy’ colors representing spring and summer that are growing in importance. Subscribers can see bedding ensembles, decorative pillows, wallcoverings, textiles, upholstery, furniture, and ceramics doused with these colors and learn about other trends we see represented within the photo gallery. Multiple European Cities — Walking through the never-ending events at Milan Design Week it was clear that there is a growing trend (no pun intended) towards using plants in design, both indoors and outdoors. While some of the vegetation was manmade (think textile vegetables and rapid prototyped flowers), it was a pleasure to see so many creatives embracing what the good earth has given us.